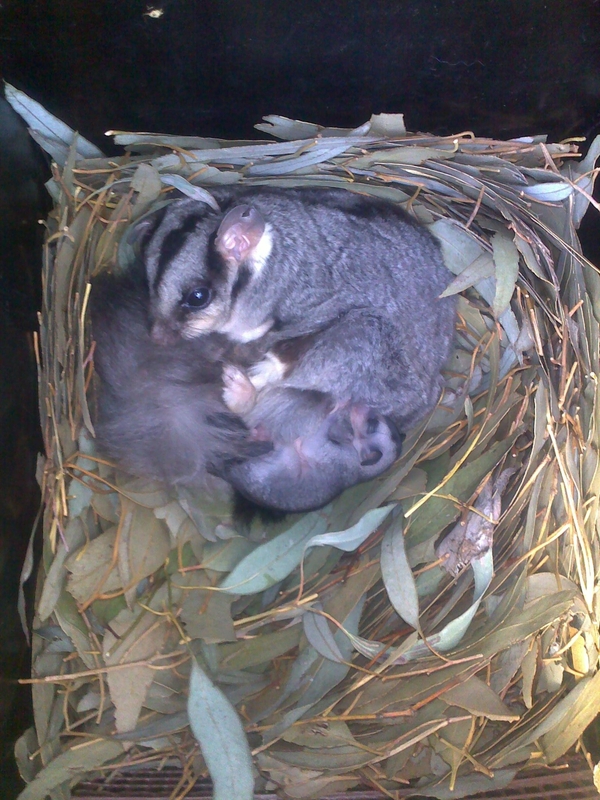 The ‘Squirrel Glider Urban Nest Box Project – Thurgoona & Splitters Creek’ was a new project rolled out in 2015 by the Albury Conservation Company. 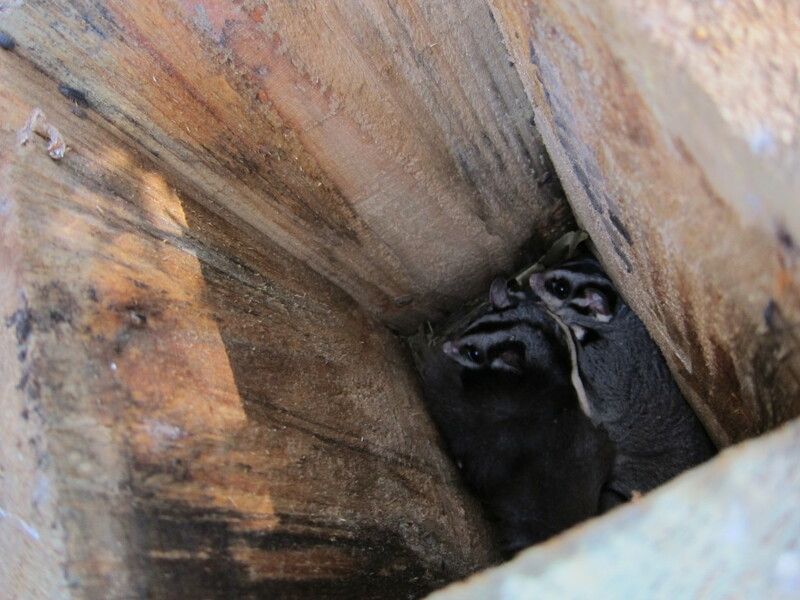 The aim of the project was to construct and install 100 nest boxes in known Squirrel Glider habitat in the more built up areas of Thurgoona and Splitters Creek, on the outskirts of Albury NSW. 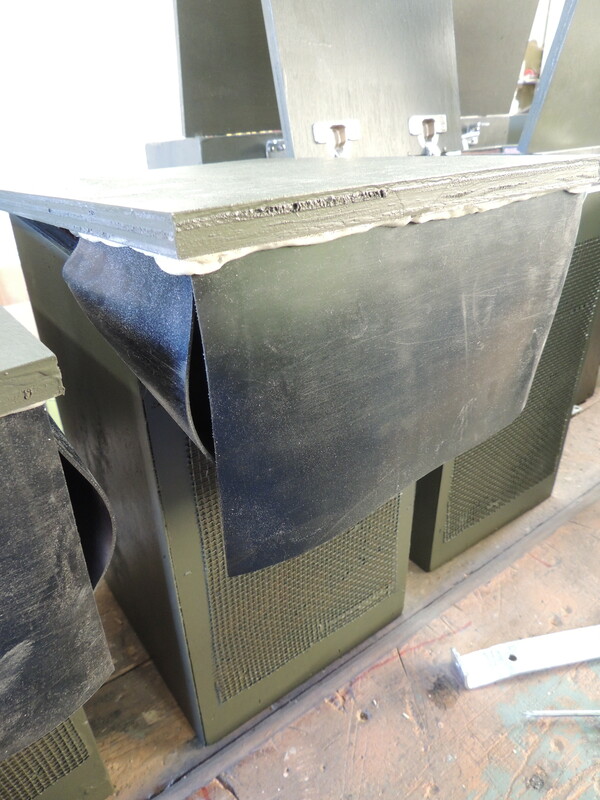 These specially designed nest boxes will hopefully compliment tree hollows, the preferred but scarce habitat of Squirrel Gliders. The program was fully subscribed with all boxes being allocated and installed by August 2015. Participation in the program was FREE for approved applications. 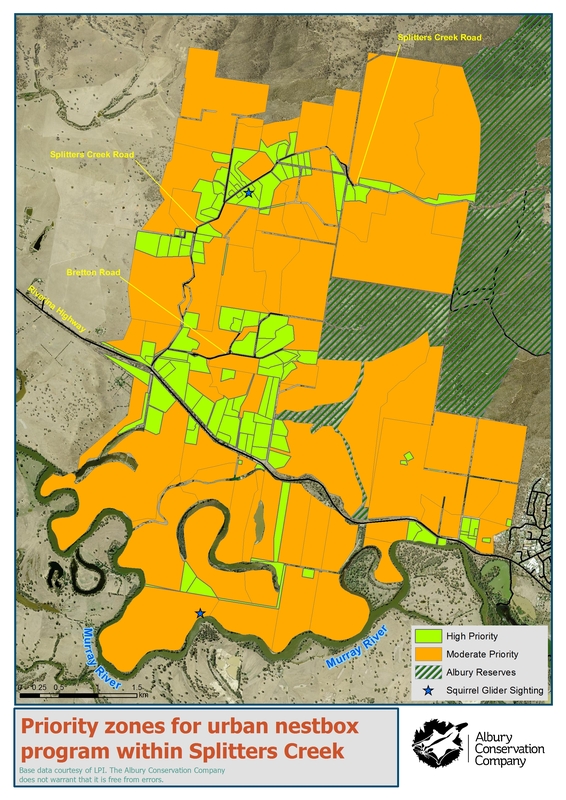 Fill out a ‘Background and Expression of Interest Form’ – copies were obtained by downloading it from this site (see link below), or picking up a hard copy from the Thurgoona Newsagency or Thurgoona Community Centre. The priority zone maps were a guide so that we avoiding giving away nest boxes to sites that are unlikely to contain Squirrel Gliders. However, if someone was uncertain whether their property was eligible we still encouraged them to submit, confident that we could provide a quick answer. This project was gratefully funded by the NSW Government’s Environmental Trust via a Great Eastern Ranges Initiative (GER) grant received by the Slopes to Summit (S2S) partnership. 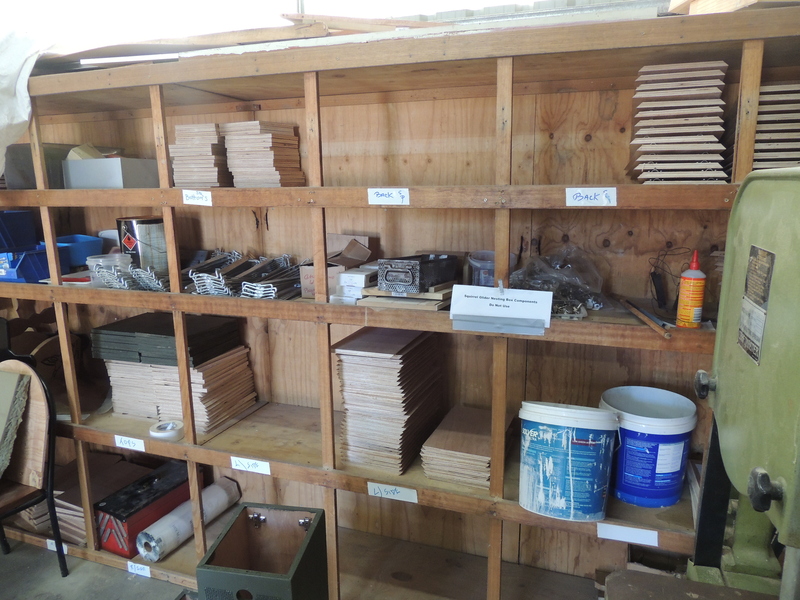 Thurgoona Men’s Shed – up to 15 members worked incredibly hard to design, test, and construct the 100 nest boxes. In the process they developed some innovative ideas that hopefully improve future nest box construction. These include a customised bracket to attached the box to the tree and making it much lighter and easier to install. They also developed a rubber baffle to deter Indian Mynas but still allow ease of access by a pole mounted camera operated from the ground. 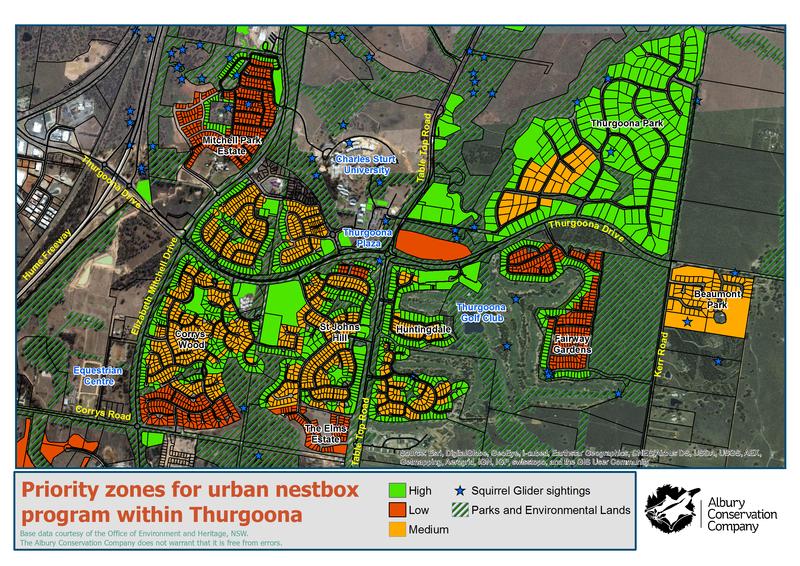 Parklands Albury Wodonga – Tim Alexander (Ranger) and his small team of staff and volunteers installed all the boxes, took GPS locations, photos, and site information. They did this without incident reflecting their close attention to safe practices when working at heights, including the use of two operators, two ladders, and harnesses. 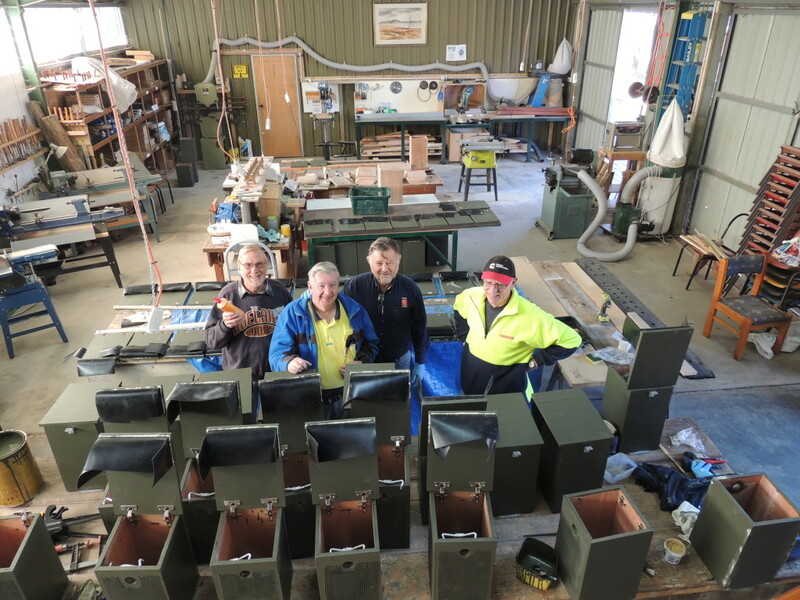 Whilst this phase of the project is now complete, Albury Conservation Company will continue to support the 2015 participants and seek further opportunities to continue and expand on the successes of the project. 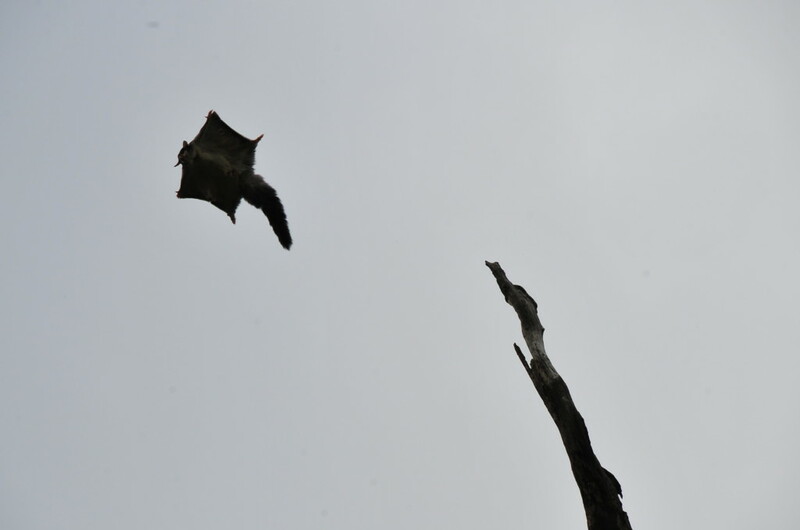 Have you ever seen a Squirrel Glider in full flight? Not many people have, so if you have consider yourself very lucky! If you are yet to in real life, you can check out this footage in the meantime.